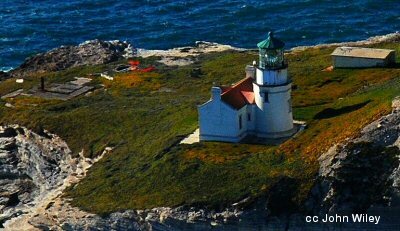 The Point Conception lighthouse stands before one of the most interesting geographical sites in California. It is the point where the Pacific meets the Santa Barbara Channel. It is also where the coastline forms a near right angle, tending south-north to the north of the point and then west-east on towards Santa Barbara. This is the start of one of the longest sections of west-east coastlines along the entire eastern Pacific. The Spanish explorers of the sixteenth century first documented the difficult sailing conditions here caused by a turbulent confluence of winds and currents. 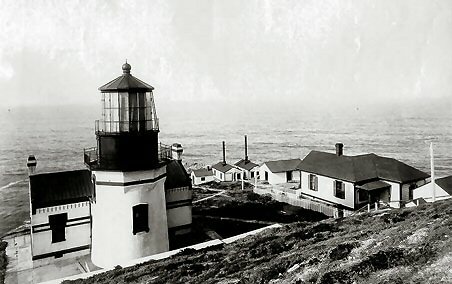 It is for this reason that the light at Point Conception was one of the first built in California. Many technical changes have taken place over the years at this lighthouse. First, it was moved off the top of the bluff, down to a small mesa, closer to the ocean. This was done so that the light would less likely be obscured by fog. The fourth-order Fresnel lens was changed to a first-order lens (larger) and finally, the station was automated in the 1970's. The residences and auxiliary buildings seen to the right of the 1882 photo at the top of the page were demolished. No matter the changes, this lighthouse stands as a sentinel not only for the numerous ships which pass by this point, but really to a California that is all but lost. There's nothing that you can see around this location that would tell you you are standing in the most populous state in the Union or even that the twentieth century has come and gone. It is a stunningly beautiful location, but alas, only viewable from the air or sea. For now, enjoy the pictures.